overall a good camera with some limitations.. Tons of features and good quality pictures.... a few downsides is the compression level on this camera even in fine mode seems to be significant compared to other cameras.. with a 128mg CF card I get 124 pictures in the highest resolution mode with the fine mode for compression...most other cameras give only about 80 picutures at this setting so there is much more compression than other cameras...which is noticble when zooming in a picture. memory cards are cheap nowadays so I do not know why Vivitar is letting us get more and more pictures on a card at the sacrifice of picture quality..If you do not plan to zoom and print a picture you will be fine. The color is good and camera is very easy to you...For a $100 camera...you will not find a better deal out there..trust me. I bought this camara three weeks ago and until this day I have no serious problem with it. The memory card works. It is easy to control and its functions are easy to operate. Yes, is noisy, but others cameras are also noisy. For under a hundred bucks, this is the best 3 MP Digital camera you can buy. Boy what a turnaround from my prev posting...The camera stopped working intermittantly...will not focus no how and take a picture...flash goes off..but nothing in the LCD or memory as a picture being taken. Turn it on and off a bunch of times and it will work....then next time you use the camera..it may or may not work until you turn it on and off again a bunch of times..and the battery signal meter is useless..it will show full strength and all of a sudden camera goes dead...needs more batteries. and the worst part of all is Vivitars customer service..or lack of..I called them 4 times...and its not a toll free #..and after 4 weeks..still no response..and I challenge anyone to find a way to email that co from their website..try it. after wasting an hour on it it tells you to sign up for this cumbersome EBOX system where someone will get back to you...same thing..after 4 weeks..no message from anyone..and they had the nerve to send me an automated email today saying my request was closed... CLOSED?? I never even got a response...trust me..stay away from this company..if you get lucky and get an ok camera..good for you..but pray you have no problems wiht it or you will experience their lack of customer service. This is my second digital camera. I love it, it's easy to use and takes great pictures! I have no complaints yet (only had it for 2 weeks!) So far so good! I bought this camera back in July. I liked it, it took pictures just fine, was a good deal for $140. But it let me down. In Feb. the zoom lens jammed. The first thing this camera does when you turn it on is pop out the zoom, so this turned it into a brick. It is very difficult to get a person on the phone and not voicemail. 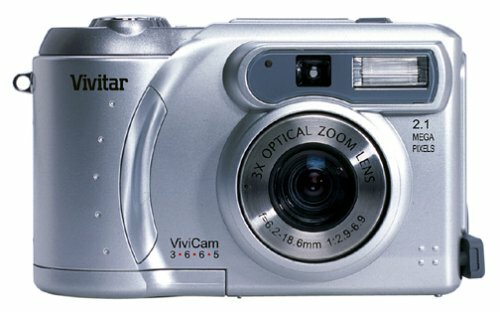 I sent the camera to Vivitar. They also make you send a check for $5 for return shipping! A month later, I received a replacement. With a bad flash, although I can see how whoever inspecting missed it, because the flash does a weak blink. Now in late April, I'm still waiting for them to send me a mailing label to return the bad replacement, because I've already paid shipping twice and should not have to pay again. 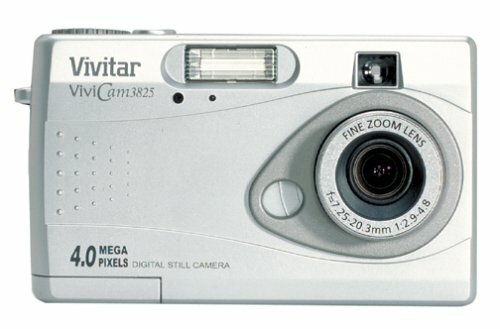 I've given up on Vivitar and bought a Nikon Coolpix 2100. AN INEXPENSIVE DIGITAL CAMERA. 3X OPTICAL ZOOM WORKS GREAT. VACATION. HAS TV OUT AND TAKES SHORT VIDEO CLIPS. GREAT BONUS. 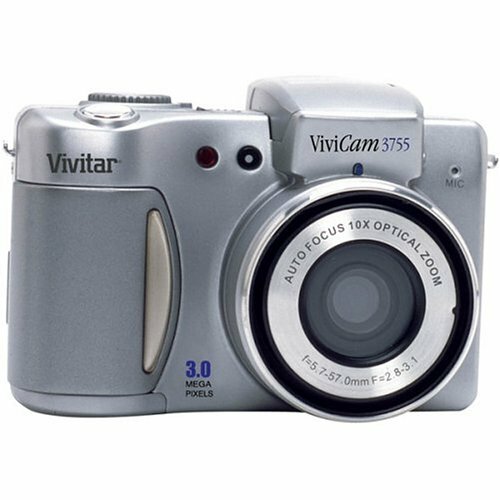 The Vivitar V3825 4-megapixel digital camera offers high-resolution imagery and simplicity of operation. Its 3x optical power zoom lens ranges from 7-20mm (equivalent to a film cameras 34-97mm) and is complemented with a macro function. Optical zoom is supplemented with 2x digital zoom capability. In addition to outstanding digital still images, the V3825 also has a burst mode allowing for the capture of sequential images in rapid succession. Images can be reviewed on the 1.6-inch color LCD and the five different resolution modes allow you to send images through e-mail or you can upload them to the Web. The camera can also capture up to 60 seconds of video using AVI format, and can provide live video up to 15 fps using your PC and its USB port. I have just bought this camera for my daughter at a Super Walmart on sale for $160.00. Brand new & still wrapped in box. Have yet to try it but it makes me feel better that I saved almost $90.00. Will let you know how it works. I looked around a bit before I made my choice with the 3825. One of the places I looked was vivitar.com where I inspected the sample pictures taken with this camera. I was impressed with their results and a little confused with the one review that complained about "grainy" pictures. There's a bit of a learning curve involved with this unit regarding making changes for indoor shooting and also being able to view the LCD when outdoors, but both can be accomplished with mastery of the manual. I guess what hooked me on the 3825 was the discounted price of $198.00. The camera originally listed for $367.00. The specs on this page are (or were) incorrect about the power requirements. It takes 2 AA cells. I did encounter grainy output when using the digital zoom outdoors, although the output through the optical zoom is excellent. I didn't realise that the pictures in digital cameras default to JPEG files. This results in colors derived from a somewhat limited spectrum. Not that this will make a difference for the average "point and shoot" enthuasist. But for closeup work where one requires an _exact_ match (like a glass lampshade) one will experience a subtle difference. I supppose all cameras in this price range save their output in this format and if one needs _exact_ color replication one must either use film or a higher end digital camera. Notwithstanding my last comment I enjoy using the 3825 and look forward to many years of faithful service from it. Bought this for my son. Most common functions were intuitive but we still needed to read the manual a lot. However, the pics were very grainy. My old 2MP Fuji Finepix had better resolution. 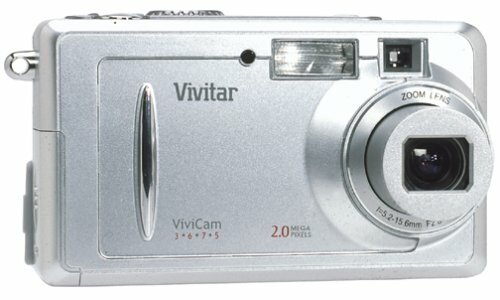 We returned the Vivitar for a Samsung Digimax 360 (3.2 MP) which we like much better. In all, a value-for-money camera, but not without weaknesses. Bought in Australia on 18 May 2004 for 30% less than the already discounted price of the other camera considered, the Fuji FinePix S5000. I had previous experience with a Kodak DX4330 (all auto 3.1MP) and did some comparative shots with the Kodak and the Vivitar. It had to be a 10X optical zoom, as I got used to long zooms during my SLR days. Originally I had my eyes on the Fuji S5000, but did not like the reviews (particularly the pretend 6MP setting, see DPReview). The price is unbeatable. The camera does not feel flimsy, even though it is plastic. Stickier surfaces would improve handhold, but shape is fine. The controls are logical and well-positioned, and with medium-sized male fingers I can comfortably reach and identify all buttons without taking my eyes off the viewfinder. The viewfinder picture is what the lens sees (SLR-like), so there is none of the annoying parallaxis error of cameras with separate viewfinder windows. The autofocus (a weak point in many reviews of various cameras) works fine throughout the zoom range. Macro ditto. The lens seems fine, although I did not play with test patterns. There is the broad range of general settings expected nowadays, eg, four exposure, seven scenes, five focus, picture colour/sharpness/contrast, ISO between 70 and 400. The range of manual-mode settings is excellent for this price. For example, there are five built-in white-balance settings, PLUS two manual pre-sets. Continuous shoot is available, as is 3 or 5 frames in a row. Exposure adjustments are available. The extent of viewfinder/LCD information displayed on settings can be changed to suit everyone. Picture-processing speed is much better than the Kodak DX4330. Operating costs are low, as it takes AA size batteries (from alkaline to rechargeables) and the cheaper secure digital cards. Precision of the sensor is not great. Images are marginally noisier than those taken with a Kodak DX4330. This is not an issue for standard print sizes, though. I am not wild about the colour. 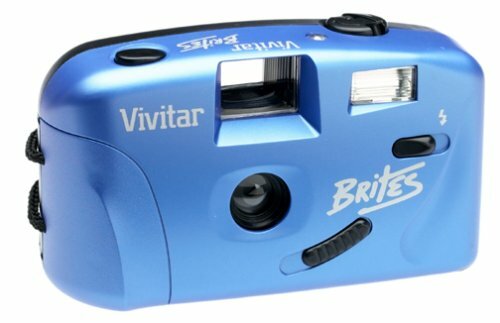 While the Kodak DX4330 had a blue bias, the Vivitar 3755 is red biased. There is no tone setting. 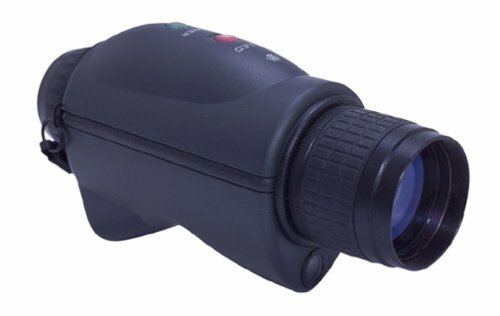 The viewfinder is quite grainy, and it can be difficult to identify objects with the zoom fully out. For people preferring to use the LCD on the back (accepting shorter battery life) this is not an issue as that latter is large and fine. Unless I missed it, there is no option for a date stamp for photos. This camera in wonderful no problems at all excellent quality pictures. Easy to use. I would recommend it to anyone... My boss just purchased a slr Sigma and he was impressed with it because of the wide range of use.. Of course its not an slr but for 349.00 it's a good deal.. This is an okay camera for your first one, but it is a battery eater!.. After about 20 pictures with flash, you need to change the batteries. Maybe I am naive but come on! Also...the flash stinks. You need there to be a LOT of light in the room to even make out an object and this is WITH the flash. Without it is just as bad. I wish I had bought instant lottery tickets with the money I spent on this camera. It takes horrible photos and takes a long time to do so. I would sell it if it wouldn't give me tremendous guilt. I think I'll throw it off of something very tall. Nice toy. I Really enjoyed it. As a tool for point and shoot, to be able to share over the internet web-resolution-pictures : I Really enjoyed it. Don't forget to take a real camera with you, but take this one too. This camera is great for the beginner who is just starting to go Hi-tech. The pros are that the camera is lightweight and compact to carry anywhere. The upload speed from the camera to pc is not that long and the software that you can edit from is pretty useful as well. The cons are simply the camera is not advanced enough to shoot anything that moves. My friend and I sat as still as humanly possible and all we got back was a blurred image of where we think our heads should have been. Also the color is not as good as I had hoped and the lag time between taking pictures seems to be forever. Some instructions in the booklet are a bit vague and took some creative juices to get the camera properly set up. 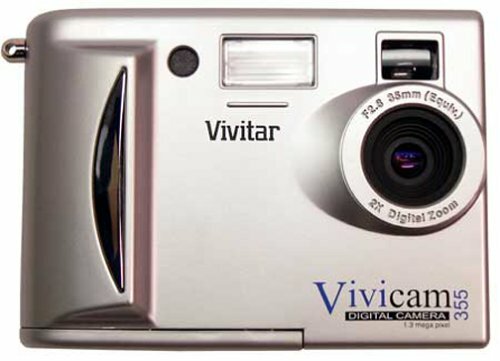 If you're looking for a digital camera to fulfill all your digital needs,the Vivitar Vivicam 3930 is the perfect choice.The simplicity of operationcoupled with well equipped with features, guarantees a perfect shot everytime. No more manual focusing or choppy digital zoom because the autofocus lens iscompletemented with continuous ADZ technolgy. Advanced step-less DigitalZoom allows the photographer to select any digital zoom level from 1x to 2xin a smooth and continuous fashion, emulating optical zoom. 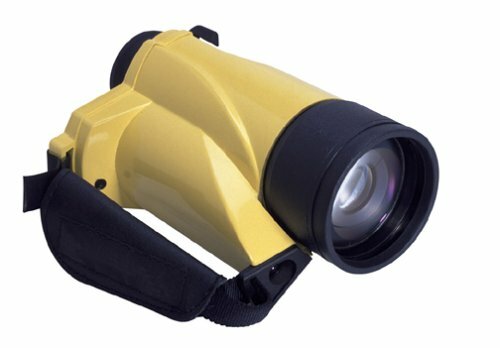 The 3930 is equipped with a 5.25 megapixel CCD imgae sensor. Images may bereviewed on the 1.6 inch color LCD and the four different resolution modesallow you to send images through email, print them, or apply them to the webat your desire. One reviewer complained that he couldn't find rechargable batteries for this camera. But the product information says it takes 2 AA NIMH batteries which are the most commonly available rechargable batteries there are. So one or the other is wrong. It comes with 1 rechargable battery. Do you want to take a few pictures then have to wait overnight while it recharges? Its manual does not state the model number of the replacement rechargeable battery to ask for much less where you can buy them or how much. And Vivitar's web site does not offer replacement batteries. The manual DOES state you can use a NON rechargable Rayovac CP1 battery in lieu of the rechargable it comes with. Do you want to have to buy a fresh battery each time you shoot pictures? Moreover, Rayovac doesnt even currently sell that NON rechargable battery much less local stores. In short, buy this camera and you will be limited to the length of its one battery and then have to wait overnight while it recharges. You will not be able to buy even non-rechargeable extra batteries for it. And IF Rayovac ever starts to sell the NON-rechargeable batteries, they will likely be very expensive and not widely available, and since they will be non-rechageable you will have to buy new expensive batteries each time. Pity. It would be a winner product otherwise. 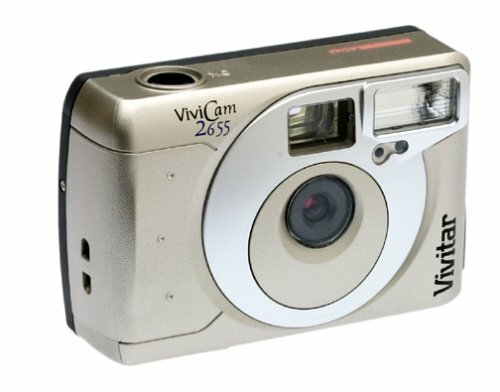 I bought a Vivicam 3615 last year. The camera worked fine for about 6 months, then the picture quality degraded significantly. The colors are all a bit "off" now and it takes poor quality images at night. Experience with Vivitar tech support was very frustrating. good camera for a great price! 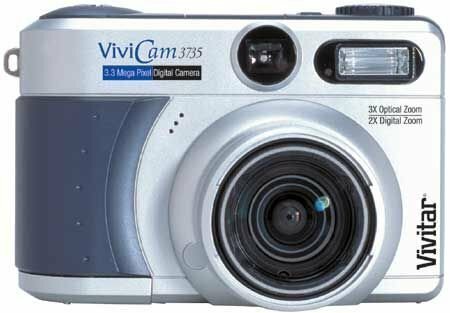 The Vivicam 3675 is an affordable choice for anyone seeking a compact, versatile, high-quality digital camera. 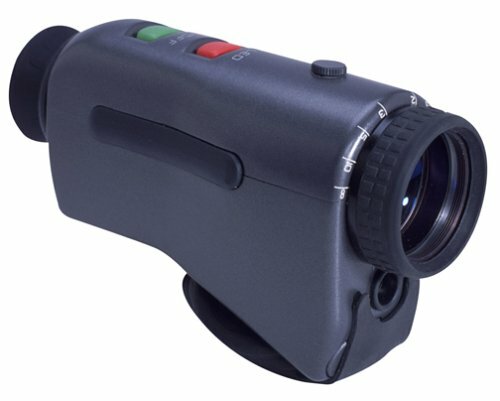 The 3675 is a 2.1 megapixel digital camera with 3x optical zoom, 2x digital zoom, integraed flash, and expandable memory. The 3675 can be used to capture short video clips and as a PC Web cam, providing live video to your PC via USB connection. It also comes with 8 MB internal memory and can be expanded using optional Secure Digital (SD) memory cards. The 3675 offers imaging versatility, with the ability to select from two resolutions and three quality settings for their images. Resolution modes include 1600 x 1200 and 800 x 600m, ideal for either print (up to 8 x10), e-mail, or Web applications. 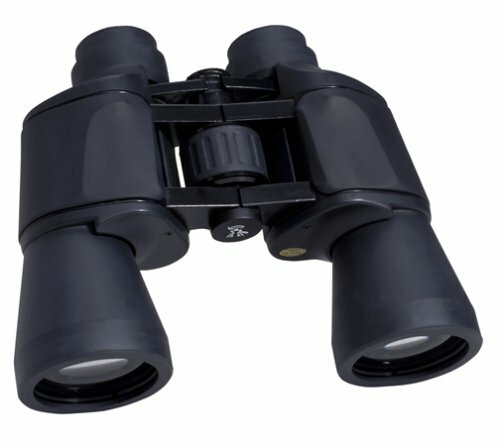 A unique feature of the 3675 is the ability to adjust the image sharpness. You can select from three levels of image sharpness (soft, normal, or hard) according to preferences and output requirements. I tried the Vivicam 2.0 for a week and must admit it eats batteries fast! But from what I'm hearing, that seems to be the case with all digital cameras. I solved that issue by buying a Duracell 1hr charger and an extra pack of rechargeable AA's. I already made a short video clip (with the 8mb internal memory you can record about 30 secs. of video) I shot in broad daylight and it came out beautiful! Minutes later I was watching it on my PC! The quality is very decent considering it's not a camcorder. This camera has lot's of features which is why I chose it above others. Records videos(no sound),limited only by memory available. Very cool hardware included in package. Has DC/in so you don't have to always use batteries. very nice in a classic way. about 1 minute for 25 pictures at high res. CONS: No lens cover! I didn't expect that. hard to get some response. The main feature this camera has above others I've considered is the extra digital window at the top which allows viewing various settings without having to turn on the LCD display. every corner of the darkest room. I have tried to overcome most issues with this camera, but finally decided on returning it and ordered a Hewlett Packard 635 which seems like a more solid option. 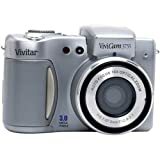 The Vivitar takes excellent photos and is very simple to use, but I find that it has a very frail construction and the controls are not trustworthy; especially the "joystick" type control on the back which started malfunctioning after a few days. I had chosen this camera over the HP at first because the HP 635 has no Video/out , but I have found that this is not such a necesary feature. Tip: before buying any camera, first try them out at the store. 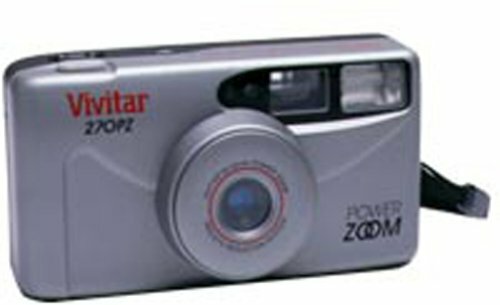 I could not find a Vivitar to try out and had no way of anticipating many things. the HP 635 I HAVE tried, and I feel pretty confident it will be a good choice.